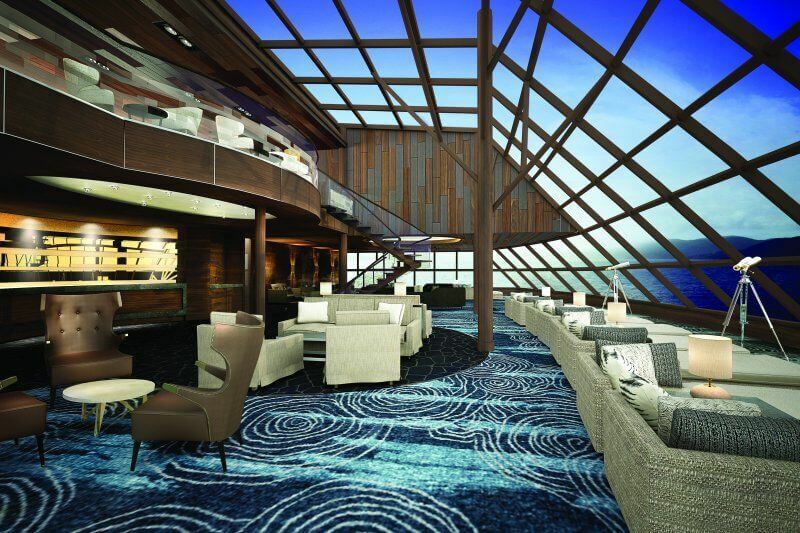 The Norwegian Bliss is Norwegian Cruise Line’s latest (and largest) ship to enter the cruise market and it is breathtaking. 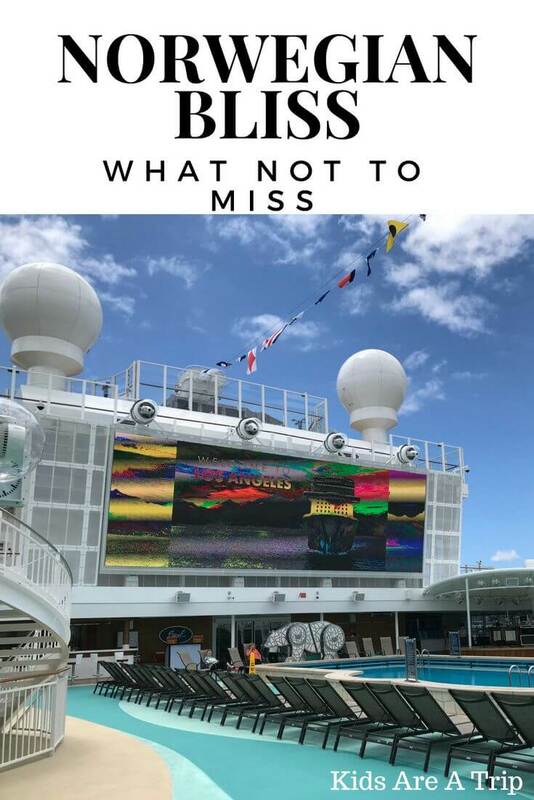 Norwegian Bliss will cruise Alaska and the Caribbean, as well as select voyages to the Mexican Rivera and the Panama Canal. 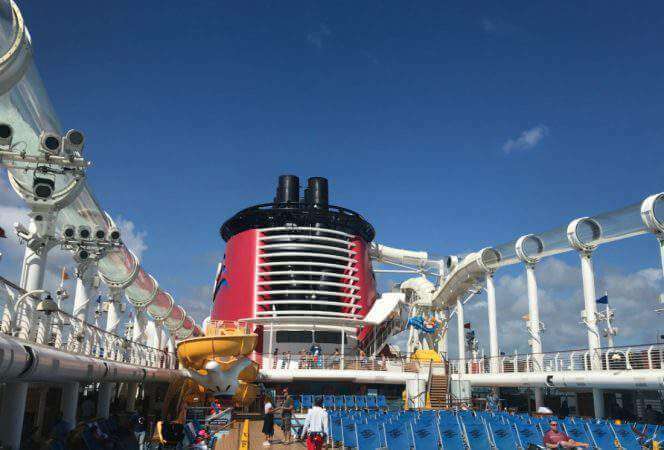 The ship holds over 4,000 passengers, has 20 levels, 16 restaurants, 22 bars and lounges, a race track, two crazy waterslides, and more. Information about all of these can be found on Norwegian’s website, but what about all of the things to discover that aren’t so obvious? 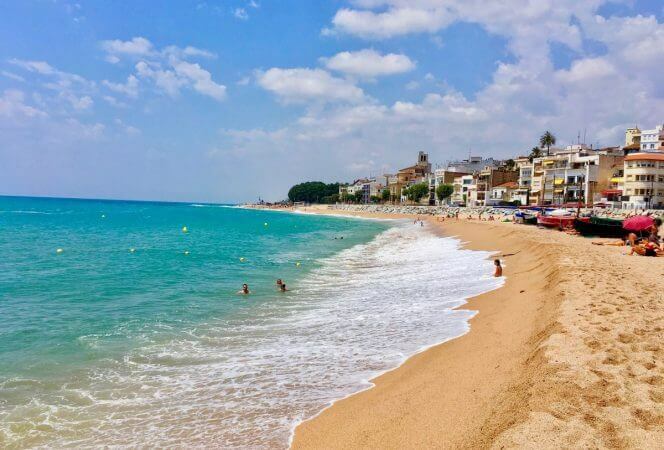 Here are some of the best things to do on a Norwegian Bliss Cruise, so be sure to set aside time to enjoy them all. 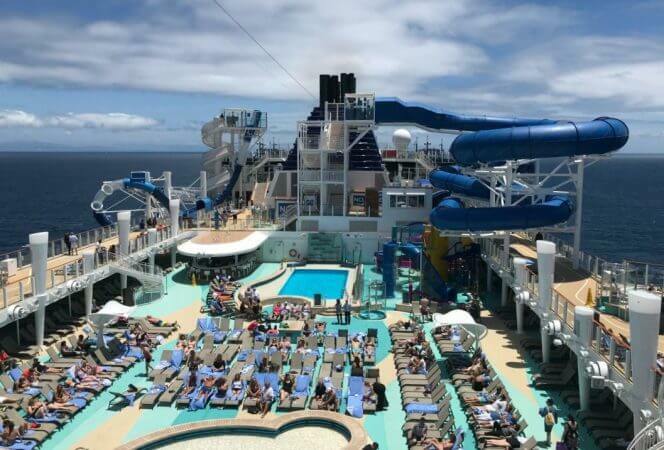 *I was the guest of Norwegian Cruise Lines for the purpose of this review. As always opinions are 100% my own. 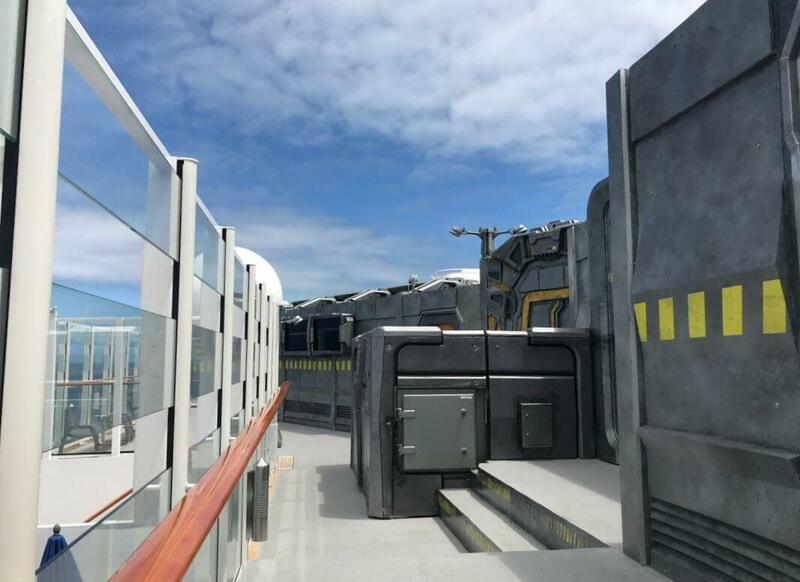 Norwegian Cruise Line’s open air laser tag course can be found on level 20 of the ship and it’s one of the most entertaining ways to have fun at sea. Participants are divided into two teams and they make their way through an abandoned space station trying to earn more points than their opponents. Be sure to book this early as it fills up quickly. This isn’t something advertised, but inside The Local is a small duck pin bowling lane. Smaller balls and pins makes this game fast and fun. It’s first come, first served, so arrive early before the crowds do. If you need some pampering, head to Mandara Spa where you can try numerous treatments from massages to a body scrub. Relax in the steamy Thermal Suite or take a dip in the Vitality Pool post-treatment. 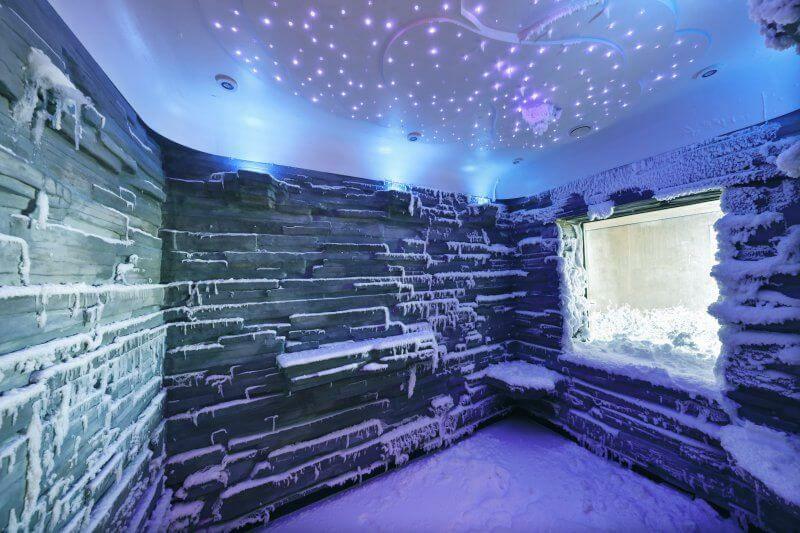 Don’t miss the Salt Room or the Snow Room for a special treat. Trust us, it’s worth it. Off in a corner of the ship and somewhat hidden, are two of the most delightful spots for dessert aboard the Bliss. The Bake Shop serves up macarons, cupcakes, and specialty candies. Dolce Gelato has the mouth watering gelato that transports guests to another place and time. Once you find it, you’ll start seeing it over and over again. With twenty-four beers on tap and more than 50 bottled beers, it should be easy to find one you like. The space has floor to ceiling windows and a cozy lounge vibe with live music. It’s the perfect hang out space. Vibe Beach Club is an exclusive space on deck 19 for adults only that requires reservations and an additional fee. 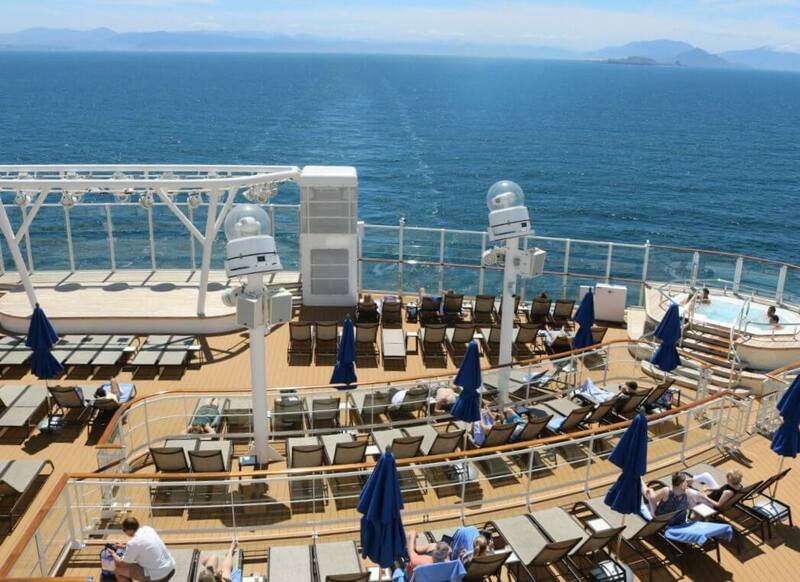 The spectacular space at the front of the ship offers stunning views and guests can lounge in chairs or whirlpools to take it all in. There’s also a private bar and servers who bring around water, cocktails on request, and fruit skewers to keep guests well hydrated. The spacious Observation Lounge is filled with intimate groups of tables and chairs meant for relaxation. All of the seats have 180 degree views through floor to ceiling windows and there’s a 360 degree bar in the center. The room is particularly magical at sunset, so arrive early to claim a space. One of the three main dining rooms, The Manhattan Room, offers classic elegance and beautiful views. The service is impeccable and food is spectacular. It isn’t one of the specialty dining rooms, but it is very special. 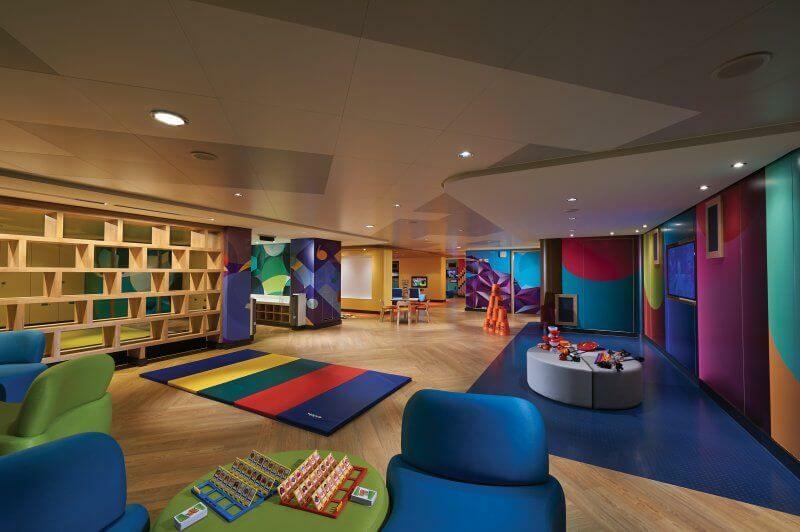 There are three different kids’ clubs on board the Bliss. Guppies is for the little ones, Splash Academy is for ages 3 to 12, and Entourage Teen Club is where teens will spend their days (no adults allowed). Younger children will need to be signed in and out of the clubs, but teens can come and go as they wish. This is perfect for parents who need some time to explore the ship on their own. The Splash Pad is a fun hangout space for kids. Located on the 5th floor, the arcade isn’t just for kids. 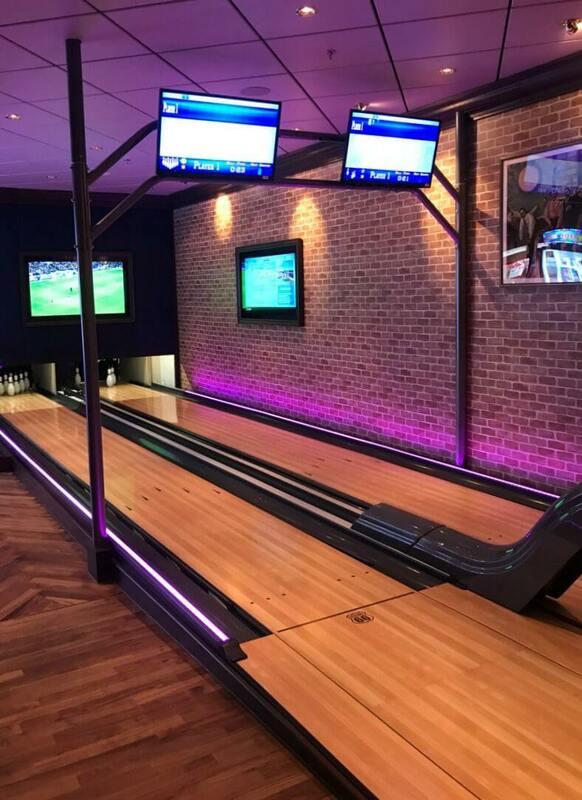 With virtual reality, air hockey, and all the latest games, it’s the perfect spot to let loose and have fun. Overlooking the race track is a four hole miniature golf course. 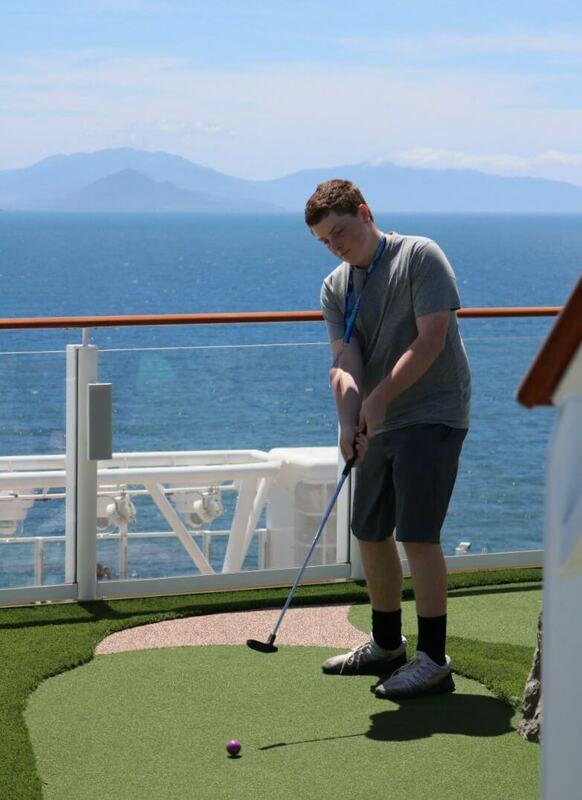 Clubs and balls are serve yourself, and it’s quite unique to play golf from the top deck with an ocean view. Can’t beat the view from here! The Norwegian Bliss brings the Broadway musical Jersey Boys to sea. It’s the story of Frankie Valli and The Four Seasons as they make their way from the streets of Jersey to stardom. People will be singing in their seats. Note, the show has adult language, so be advised. ¡Havana! is the other on ship production created just for Norwegian by Tony Award winning director and choreographer Warren Carlyle. It features a vibrant story and spectacular costumes as guests are taken back in time to 1950s Cuba. It’s pretty awesome! The Haven is an exclusive area of the ship with private key card access to the most luxurious spaces and accommodations on the ship. Guests will enjoy the services of a 24 hour butler and concierge as well as their own private sundeck, lounge, and restaurant. If you haven’t booked a room, ask staff if there’s a room available to tour. The Haven has its own private lounge with stunning views. 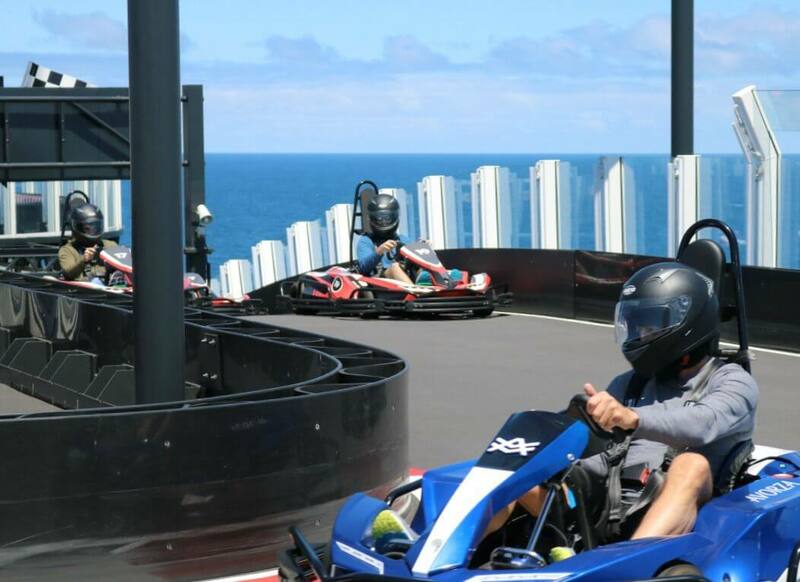 One of the main attractions on Norwegian Bliss is the two level race track, the largest at sea. The experience certainly lives up to the hype, as drivers are given instructions, helmets, and sent on their way, flying through the course. Make reservations early for this one too as it’s sure to be a top attraction on the ship. Inside the speakeasy is where you will find Happy Hour Prohibition – The Musical. This show transports guests to January 16, 1919, the eve of the Prohibition era. Entertainment is lively and the cover charge includes five premium cocktails created just for the show. Social Comedy & Night Club showcases to stand-up comedians every night followed by a DJ who spins the latest hits. You’ll get a work out with all the belly laughs and hip shaking! Coco’s is more than a dessert shop, it’s a dessert experience! Don’t miss the creative concoctions like Cookies N’ Cream and Snickers milkshakes. There are a feast for the eyes and the stomach! There are two multi-story water slides on the Norwegian Bliss, Ocean Loops and Aqua Racer. 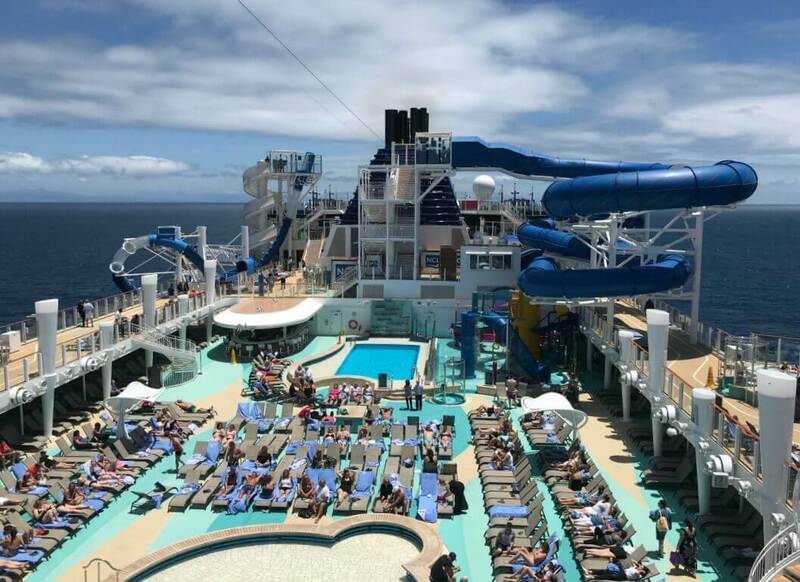 Ocean Loops takes you over the side of the ship, and Aqua Racer allows you to race side by side down the slide. After a ride, head over to the Aqua Park with its water obstacle course and smaller slides and then hit the lounge chairs or hot tubs.